The CN2110 series has been discontinued. Please see the CN8200 Series as a possible alternative or contact our electronics technical support at 1-800-639-7678. The CN2110 Temperature Controller offers simple setup, flexibility and control features in an attractive, compact design that both OEMs and users will find costeffective. The CN2110 is housed in a rugged, plastic 1/4 DIN package that only requires four inches behind the mounting surface. Straightforward operation and easy-to-use control features are major strengths of the CN2110 controller. The CN2110 features a variety of output modules including High Current options of a 10 Amp Solid State Relay or 20 amp mechanical relay. These outputs can directly control many cartridge or strip heaters, eliminating the need for a remote contactor or solid state relay. For larger three-phase loads, the CN2110 can drive a remote device with the Pilot Duty Relay or Solid State Relay Drive outputs. The optional Alarm Output gives you a non-latching, normally deenergized, 5 Amp relay output for over or under temperature protection of critical process temperatures. The CN2110 features a NEMA 4X front panel with tactile feedback push buttons. Large, bright LED’s provide an easy-to-read interface at a distance. Outputs are plug-in modules that are field replaceable. The switchselectable control modes include On-Off or Proportional-Integral (PI). Sensor type J, K, RTD are also switch selectable. No programming necessary. The CN2110 features high current output switching (relay and solid state relay), eliminating the need for an external power switching device and reducing installation cost. Single phase loads up to 20 amps may be directly connected to the CN2110, eliminating the need for a remote contactor or solid state relay. The internal relay option can switch up to 20 amps or the internal solid state relay option can switch up to 10 amps. 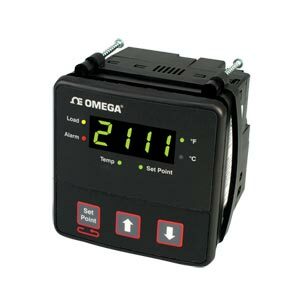 The CN2110 automatically detects the output type and adjusts the controllers setting for optimal control. The CN2110 provides precise, solid state proportion control with automatic reset (PI) that will control most heating applications. ON/OFF control may be selected for applications where maximum output life (load switching) is needed.